We introduce a variational framework for separating shading and reflectance from a series of images acquired under different angles, when the geometry has already been estimated by multi-view stereo. 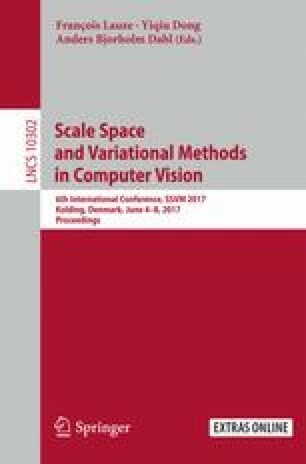 Our formulation uses an \(l^1\)-TV variational framework, where a robust photometric-based data term enforces adequation to the images, total variation ensures piecewise-smoothness of the reflectance, and an additional multi-view consistency term is introduced for resolving the arising ambiguities. Optimisation is carried out using an alternating optimisation strategy building upon iteratively reweighted least-squares. Preliminary results on both a synthetic dataset, using various lighting and reflectance scenarios, and a real dataset, confirm the potential of the proposed approach.